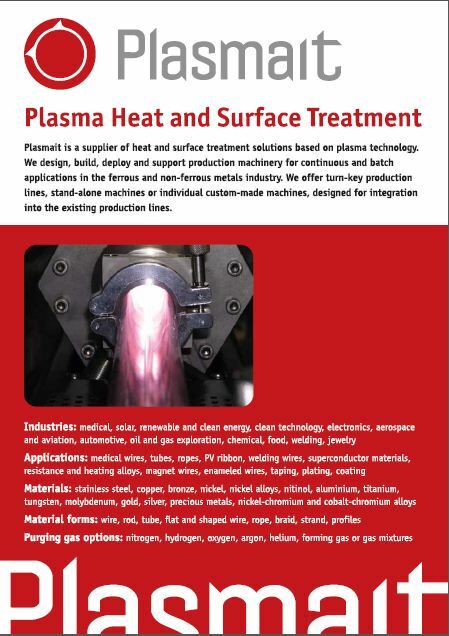 Plasmait uses proprietary patented plasma technology for heat and surface treatment of various materials. Plasmait solutions have been utilized in continuous (wire, tube, strip) and batch production on a wide range of materials. Plasma heat treatment can be described as a ion bombardment on processed material surface. On impact with the material surface the ions release their energy to the material resulting in heating effect. Dirty deposits and oxides layers break under the impact of ion bombardment (micro sputtering) in the plasma chamber. Carbohydrate substances disintegrate at high temperature. Dirt, lubricants and oxides that are removed from the material surface in the plasma chamber are extracted through the exhaust pipe of the vacuum system. Plasma treatment is generally not economical for removal of large quantity of contamination from the substrate surface. It is recommended that a suitable conventional precleaning is applied before plasma treatment in case of high surface contamination on the substrate material. Plasma process can instigate chemical reaction on the wire surface, providing that the right choice of processing gas and process parameters is used. An example of such a surface treatment is dry (chemical-free) removal of surface oxides and lubricants. Plasma can be used as a dry alternative to acid pickling or electro-chemical polishing. Plasma treatment leaves the surface clean, dry and without catalysts for further oxidation. Plasma cleaned and deoxidised surface tends to oxidize at a slower rate than chemically cleaned surfaces with inadequate rinsing. Unlike pickling or electro-chemical polishing plasma treatment does not lead to surface erosion or loss of base material. 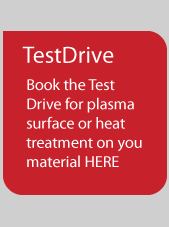 Plasma treatment does not damage the material surface unless extreme and unreasonably powerful plasma is applied to the processed material. 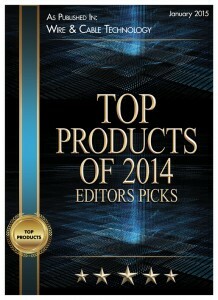 Chemically reactive plasmas are used for surface treatment applications. They instigate a specific chemical reaction of the material surface such as deoxidation, degreasing or surface activation/passivation. The magnitude of the above effects depends on the processed material and its surface condition as well as the type of plasma and its power. Plasma treatment is a contact-free process. Material does not touch plasma chamber in during heat treatment (as is the case in conventional furnace or resistive annealer). This prevents surface damage on the processed material and reduces physical wear of machine components and associated maintenance. Efficient energy coupling makes plasma heat treatment one of the most efficient means of heating for most conduction materials. High heating efficiency is pronounced in high temperature ranges and high temperature applications where conventional means of heating show their weaknesses. The consumption of purging gas is lower than the consumption of gas in conventional annealers. Process gas is fed to the plasma chamber at low-pressure making total gas consumption small when compared to the traditional annealer using inert atmosphere. Operation under the vacuum also minimizes the possibility of uncontrolled leakage and associated gas wastage.